Wow. Your responses to the theme I launched this week were fascinating and even more numerous than I’d hoped for. What comes out of them is a gender spectrum that seems to stretch from lavender/fougères to white florals. Fracas seems to represent the most extreme case, so femme it’s almost woman-as-drag-queen, but tuberose in general crops up again in again in the answers of both male and female perfume lovers, as the ultimate transgression of gender boundaries (for men) or expression of exacerbated femininity (for women). Certain types of woody-ambers and fresh-aquatic-metallic notes, because of their clichéd use in masculine fragrances, also veer towards the male end of the spectrum; leather, vetiver and strong terpenic notes (the drier cedars, incense) also lean towards masculinity but are considered freer of gender stereotyping and thus, adopted by men and women both. Chypres (green, aromatic or leather rather than fruity) seem to occupy a middle ground. 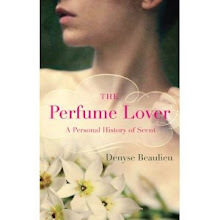 I’m no perfume historian, but looking back, I get the impression that the olfactory gender divide, though it sprung for the industrialization of perfumery at the turn of the last century (once products were given “proper” names and sold in especially designed bottles, they had to be marketed to a specific public), established itself more firmly as the industry as marketing took over between the mid-70s and the mid-80s. I can’t tell the age of the people who responded here, but I can guess that many acquired their first knowledge of fragrance during that decade or afterwards. The 80s were an era of big perfumes: padded-shoulder powerhouse fougères like Paco Rabanne pour Homme (1973) or Azzaro pour Homme (1978) and clear-the-room florals like Chloé (1976), Giorgio Beverly Hills (1981), Ysatis (1984) or Poison (1985). So it makes sense that the perceptions of what represents masculine and feminine notes were forged at the time. Perhaps perfume, being other – that’s not the way any of us naturally smells – is the ultimate way of taking in the Other and blending it into our own personas, whatever our gender or sexual inclination. After all, as I’ve written before, fragrance is nothing in the bottle: it needs skin, air, noses and brains to truly exist. We perform our perfumes, each of us bringing in our stories; perfumes become part of those stories. Masculine, feminine, yin and yang: the possibilities are endless. Now go out and play! The winners of the Womanity sample draw are Winn and Tarleisio. Please contact me with your details at graindemusc at gmail dot com. Some of your readers' comments were frutrating in the sense they don't tell us what kind of person they are. Women tend to say more they're women, "from a female perspective", well but what kind of woman are you in the gender spectrum? Are you a soccer mom or are you a fashionista? Most guys didn't say they're men, and if they are men, what kind of men are they, construction guys or interior designers, masculine or effeminate, gay, bisexual or heterosexual? What I thought was interesting was to relate what kind of men and women like to wear or feel comfortable wearing what, but it didn't happen. Uella, that's probably my fault for not asking people to say a bit more about themselves. With some of the pseudos, I had to really pay attention to figure out the writer's gender -- should have asked about that as well! On the other hand, it was interesting trying to deduce all of that purely based on perfume choices -- the olfactory representation or subconscious, as it were. When I was a kid, I loved my mother's Chanel No. 5 so much, I'd dab some on myself. Strange looks I got, mom included. I'd consider myself "extremely hetero", but w/ a good dose of effeminate qualities. The gall to say metro, before metro was ever in! Honestly, though, what I cannot stand are overtly "masculine" scents; total gender overkill! A strange mix of feminine smells w/ masculine personality is my approach. While tuberose is definitely a favorite of mine (and one that you, D, rightly, suggest as a great gender-bender of both sexes), I also love roses, irises, and violets on myself. Marcus, I'm afraid I myself tend to practice gender overkill at times (which somehow turns into the opposite -- heroic tuberose anyone?) but I enjoy it less in a man. There'll be a new iris-hyacinth out this fall at Serge Lutens which I think might interest you. Well, if you can gracefully execute gender overkill, that's another matter entirely (a good thing)! But, I'll admit, I can more easily appreciate women who brave "moustache"-y scents... to me, doing this brings out the true essence of a woman, distinct from the perfume spritz. Thanks for the heads up on the forthcoming SL; as of late, I'm in love w/ Feminite Du Bois. Marcus, though many people are a little disappointed with FdB's new formulation, I admit I own both and find it to be one of the greatest fragrances of the post-classic era. Despite its name, I wouldn't say it was specifically gendered. I was thinking just that (about the misnomer). I would even suggest that SL's admission to its reformulation was a good thing, given the fact that the stuff, while reformulated, is still damn good. I also wonder if perhaps it would be difficult to divine a particular kind of perfume that a particular kind of gender identity preferred. Of course, I admit to a bias there myself, because I am fond of believing that one should make no assumptions about perfume assignments based on gender assignments. I should also probably point out that one of the reasons I liked the pseudonym I chose when I sprang into perfume was specifically because it did not demand a gender connotation. Which probably tells you something about me...but what? Is that identity? Politics? Trying to simply cover my "real life self" and adopt an avatar? Old Spice was a carnation scent, right? I think that didn't get mentioned in the previous post's comments. Okay, that's three; I'll stop for now. :) I'm glad you took this up, Denyse. Worthy of exploration, from all the angles. ScentScelf, I didn't request any type of identification because it didn't occur to me, but of course it's not irrelevant whether one is a man or a woman in this particular matter. What people choose or not to disclose about themselves is entirely up to them. Or even what *occurs* to them to disclose: it's not necessarily a matter of intentional disclosure (or non-disclosure), especially in blog comments, which tend to be fairly spontaneous. All things considered, and despite what I answered Uella, what interested me in the first place was a glimpse into what the people here considered (too) masculine or (too) feminine, no matter what their gender, sexual orientation or sartorial choices, none of which are my business. I do believe that our choice of fragrances does express/produce identity(ies), whether consciously or unconsciously: a sort of olfactory double, as it were. I'm happy this discussion, and your comment, have helped me formultate that idea, which was hovering at the edge of my thoughts half-unformed. Merci! Alyssa, as I read both your and ScentScelf's comments before responding above, I believe my answer goes for both her comment and yours, actually (another case of shifting identities, perhaps). "It conjures your phantom selves": exactly. This is extremely relevant to what I've been thinking of lately. And very deep. This discussion is suddenly going beyond what I'd hoped for, into what I think just might be something that's never come up on the blogs in so many words. ...usually I post as "Dee," but couldn't figure out my password (sigh). I'm an extravagant fashionista with immaculate hair, eyeliner, and pantyhose... while the rest of the time I'm a no-makeup, hair-in-a-bun, yes these are hiking boots kind of woman. As with my fragrance choices, my gender identity is fluid, ranging from hyper feminine to androgeny. My husband, on the other hand, is always hyper masculine with a helping of metrosexual... and he's been wearing Chanel no. 5 for the past two days. I don't think that you can draw a generalization based on real-life gender identities. Are gay men more willing to blur gender lines? I don't think my hubby is too much an anomoly wearing and enjoying abstract florals (or even soliflores). There are norms, here in the US at least, for masculine and feminine. These are generally well-known, and with those norms in mind we can have a discussion about Masculine/Feminie fragrances, irrelevant to our particular gender identity. What might be more revealing, I think, is asking not "where are you in the gender spectrum," but instead,"how comfortable are you in the gender spectrum?" Dee, I never attempted to establish generalizations, except inasmuch as there seem to be notes/fragrance families that are commonly *perceived* to be at the extreme ends of the spectrum, based on the answers to the previous post. Where people place *themselves* on the spectrum can be more or less relevant, depending on the extent to which their style is fluid and mutable (alternating between several registers) or fairly consistent (some people have a style and stick to it). In either case, the contrast (or lack thereof) between the visual signs, attitudes and fragrance can be of relevance too. As I said above, the point of the discussion I started was the perception of the gender of notes. But as it turns out, people's perception of themselves within the spectrum, of how comfortable they feel with its variations, is also very interesting: perception *does* depend on the position of the observer, within the cultural codes and their own relationship to those codes. I've spent so much time reading and pondering your thought provoking posts and the ensuing comments, that I realize I haven't actually left a comment. I think "too masculine" would only be those scents with what I call the "shaving cream accord". Lavender doesn't register a gender at all for me as I practice aromatherapy, and I think of lavender's healing applications first. With that said, I love Jicky and Sous Le Vent. I remember being shocked to learn that Old Spice was originally marketed to women as my father wore it, and so to my mind, it is the height of masculinity. As a female, there isn't anything that I would really call "too feminine" although there are notes that aren't my favorite (tuberose, violet) and scents can easily be too sweet for me. So the same preferences would apply to what I was smelling on a male. I realize that my perfume preferences are much like my clothing choices - fairly androgynous. My favorites being chypres (long live chypres!). I'd like to think that means I've made the sacred marriage. I feel quite sure that our choices and opinions are molded by the marketers. If 100 years ago, fougeres had been labeled feminine and marketed to women, then we would all agree. Sorry Denyse! I wasn't trying to imply that you were making generalizations; I should have been more clear. My response was more generally to the many comments that followed the discussion, and more specifically defending my not having specified previously my "place" in the gender spectrum in my original response(to the preceding article). Denyse, this is interesting, what you propose: That we express/produce phantom selves. I love that you include both expression and production; I think there is discovery to be made as we explore scents and our comfort with them, as well as the contours we put on "like" (as in why, how much, when, etc etc etc). No, I wouldn't say man or woman is irrelevant, so long as we are understanding that refers to a multi-faceted, dynamic identity that is "gauged" internally and externally. Glad you chose to write a follow-up, Denyse. This question has been explored sensitively and intelligently by you and your readers. I don't think this has been mentioned yet, but it just occurred to me that there is room to discuss a certain chicken/egg assumption here. From my understanding of your perspective, culture and marketing has created the gender divide. I'm wondering, however, whether the gender divide - reflecting our innate, hard-wired preferences - happened first and our culture and marketing came second. I would say that has been my experience. For my whole life, I have been drawn to certain sights, smells, textures, sounds quite separate and apart from any outside influence. That would explain my change of heart about the Prada lnfusion de Vetiver; I was quite enjoying the idea that I was buying and going to be wearing something marketed to men: breaking the rules, being an independent thinker. But the olfactory preferences I was born with refused to cooperate! That would explain the variety in responses as well, since, while most of us are born completely female or completely male physically, each of us falls somewhere along the male-female continuum in other respects. Very interesting this idea of using scent to conjure up one's phantom selves, and being able to change scent on a whim more readily than other personal characteristics. What you say about marketers: it's probably not as clear-cut as that, because there's also a strong cultural substratum of associating manliness with "clean" or "rough" rather than "creamy" and "floral", for instance, which translates as "seductive". The range of what was socially acceptable for a man to smell of became reinforced by the marketing, but I think it springs in the West from the sartorial gender definitions than sprung up from the rise of the bourgeois/capitalist society of the 19th century. ScentScelf: the choice of *signs*, whether deliberate or subconscious, sartorial or verbal, is a type of writing to which I believe scent can be added though it is harder to decrypt. Can you tell I've been raised on Roland Barthes? Robin, perhaps it's my own particular intellectual training that's at play here, but I tend to resist as much as possible the idea of "innate". In the particular case of fragrance, the history and ethnology of its use doesn't bear it out. Now of course there *are* tastes that we acquire before we even form conscious memories: the foods we tasted in our mother's amniotic fluid. Because of the link between taste (as in food) and taste (as in discrimination) in many Western languages (at least in the ones I'm fluent in, French, English and Spanish), there's definitely something to explore there. I'm not sure there's been research done on the relation between those tastes acquired in-utero and olfactory preferences, but newborns *do* practice olfactory discrimination by turning to their mother's smell. I am also firmly convinced that our experiences reformat and remold our tastes as we live -- "bitter", for example, is definitely an acquired taste. At that level, experience, cultural models and individual processes of identification (whether to a person, a group, a lifestyle) intervene very strongly. This is definitely borne out by the progressive evolution in their tastes experienced by perfume lovers, as it is in the case of gourmets. Alyssa, I know exactly what you mean about writerly greediness! Of course there's no preventing your using the expression and developing it even though it's out there. Now for my own bit to add to the concert, bouncing off what you say about Victoria's post: I believe perfumes can produce extra, parallel lives. Nozknoz, I'm definitely not a scientist though I'm a science geek, but it seems to me that experiences acquired and reinforced as they are repeated can re-wire our brain circuits. And if we've got the ability to perceive smells that don't exist in nature, then there's a huge potential for that type of complex development. Wonder if there are been any studies of the development of certain neural areas in people who have to exercise and train in aroma discrimination, like perfumers or wine tasters? I should go back to Dr. Gilbert's book to see if he mentions anything about it. I've only read it once. Denyse, I believe one of Gilbert's primary hobbyhorses is that perfumers don't necessarily have a sharper sense of smell than the rest of us, what they have are better developed frontal cortexes--the same area of the brain that correlates to language development. In other words, perceiving and distinguishing between smells is a learned activity that improves with use and memory, just like the acquisition and deployment of vocabulary. But we knew that already, didn't we? 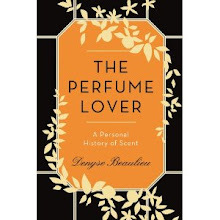 To me, the interesting part is the connection to language, considering how many perfume fans in the blogosphere also seem to be voracious readers...and there are not a few writers amongst us too, eh? Denyse, I can't tell you how much I've been enjoying this "conversation" between all of us. I particularly liked your last response to my comment. So much food for thought. My own thinking is generally to try to weave in as many interrelated answers to a question as possible for the fullest and most complete picture, so I'm always looking for the connections and trying to find as many as possible. Whenever I can resist an either/or view, I try. I guess that is the extent of my intellectual training. For example, whereas bitter may well be a taste that is developed through exposure, it may also be that we have an innate ability to appreciate that sensation and can access that when our sensibilities mature. Part of my own journey has been to come around to the idea that part of our character, our views and our preferences is innate. I think I've been fighting it to a degree. You have much more intellectual training than I, and I defer to you on those matters. In my own life, I'm finding great pleasure and satisfaction in getting in touch with my innate self. I'm finding it's also helping me understand the world at large, my connections to it in a fresh context. Alyssa, from what I've seen of perfumers, I can confirm that they don't have the noses of bloodhounds -- and they don't much like to do the "what am I wearing?" party trick either. Clearly, as you say, it is an ability than can be developed, even in later life. Robin, whether we speak of "innate" or of "deep-seated", or "subconscious", there are things we feel connected to in ways we can't explain, and that's part of the beauty of tasting the world. There's a point where there's probably little point in determining just how we got that way -- the important thing is acquiring the ability to open yourself up to the beauty. Denyse, this has been such an interesting discussion. I happen to love really femme scents like Fracas (or, really, any big tuberose) on men, but I can't decide whether it's purely the smell, or whether there's something transgressive about it that appeals to me. Honestly, I think it's the smell! For myself, the (traditionally) masculine fougeres are the trickiest, but again, I think it's more a vague, general dislike of the lavender or herbaceous quality rather than the "masculinity" quote unquote. And I'm loving the recurring mention of Old Spice (which probably doesn't even exist in France?) My father still wears it in aftershave form and, removed from context, it's quite pretty-smelling! March, ah, but you don't *know* why you dislike it -- maybe the masculinity of aromatics? As for Old Spice, I've never looked for it here but remember I grew up in Montreal. My dad still uses the deodorant. And remember "soap on a rope"? I think it smells like Coca-cola. i feel so happy with my post from yesterday: i was talking candidly, yet i seem to have coincided with an expert like you, Denyse (i am very poorly today, and therefore must encourage myself). I enjoy so much the type of discussion that is evolving here.Is only gender we are discussing? I wonder. I was at a cinematheque yesterday, to watch a documentary. The woman sitting beside me had Aromatics Elixir on her and all around her, and I felt attacked, no less. I was wearing Tolu body lotion by OJ with a mild spritz of the edp. In the war of volume I had been defeated, yet my sense of aesthetics had been reassured. Idenity, as such, doesn't exist, as we've been sagely taught by Lacan. Yet nature has given us a few indications concerning what,very clumsily, I would call olphactive reality. The vanillic mother's milk, yeast of a baby's nape when it wakes up from its sleep, acrid armpits, men and women as they love, a ripe pear, must and mould and lemony wax and leather and oak in a real library, the mysterious intertwining of orange blossoms and sea breeze with crushed pine needles. Tea brewed with the purest water. Mm? What are we, I dare ask myself with no pretentions. There is a language, a syntax: I guess some chemist of the not so distant future will tell us which molecule means what for humans of a given culture. However, nothing will alter the poetry of going into a persona or leaving it behind, or awakening to find it gone. When I read that Manoumalia contains 'fragrea', what does it mean to me? If i read Lentisque? "smooth amber"? Dry vanilla? I am a nosmic gnostic when it comes to the meaning of fragrance. The mere conviction of all religions that fragrant offertories are valuable to the spiritual world is a marvel. The field of psychopatholy is very telling on this respect. 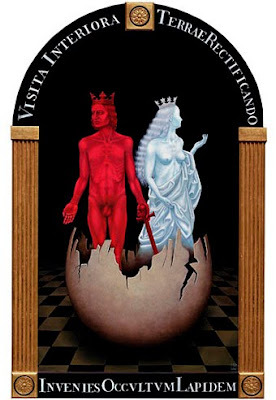 The narcissist's idealized 'skank',the obsessive's ritual self cleansing. And snobbery? Class? Ethnic origin? Diction? Sorry for writing so much. Eleven European Mystics, this is the syntax perfumers take to another level, and teach us to appreciate by bringing together accords and shedding new light on them. The words that go with them summon more finely layered appreciation. But you're right, it does go beyond gender: personas do too, and being-there-in-the-world. There will always be some sort of consensus on taste (i.e. what a particular smell conjures) at given moments of time and place. The best perfumes break free from it while conjuring enough familiarity to anchor ourselves to them, just as certain notes weld a fragrance to skin while others go out in the world. I'm just thinking how very fortunate we are to have Grain de musc. This thread is an excellent example of the high calibre of comments I have come to look forward to reading here. What would we do without you, D? Ladies: this must be the cue for the blushing emoticon. Thanks, I've really been enjoying the way this theme has developed.